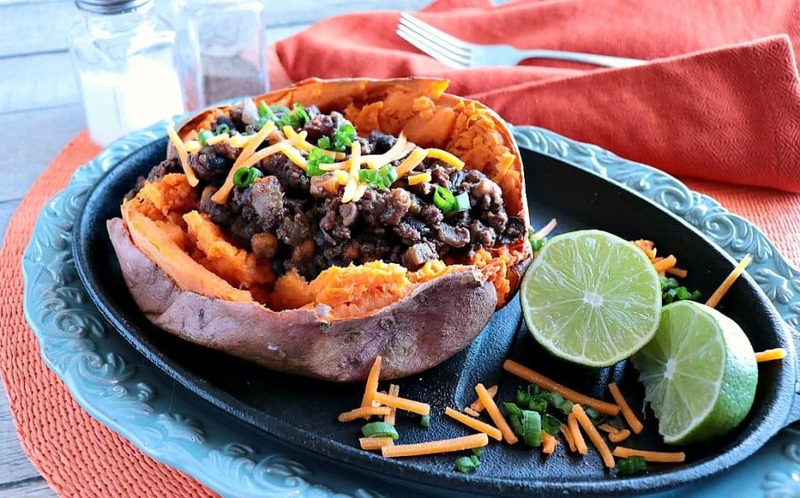 When you want to spice up your dinner options, but still want something healthy and quick, this recipe for Spicy Smoky Tex-Mex Stuffed Sweet Potatoes with Ground Beef & Beans may be just the thing you’re looking for! 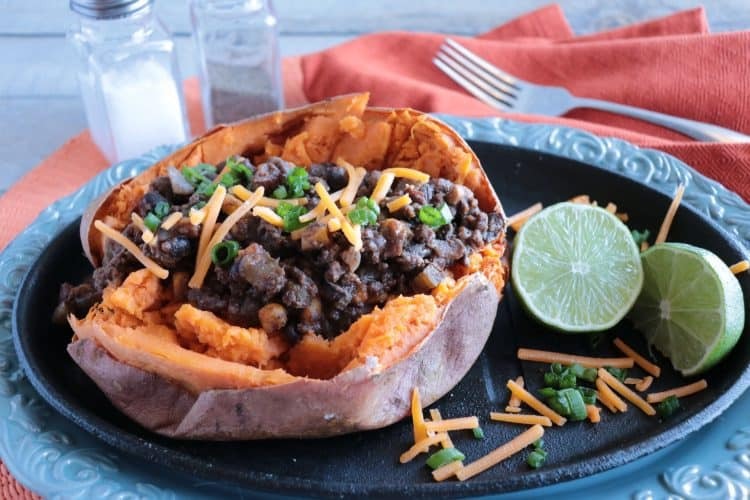 When I originally made this recipe for Spicy Smoky Tex-Mex Stuffed Sweet Potatoes I used ground beef. However, if you’re looking to lighten things up and make it even healthier, ground turkey is always a great option. The recipe instructions will remain exactly the same. Sweet potatoes (I like the large ones), ground beef, chopped celery, chopped onion, canned black beans, canned fire roasted chiles, canned Rotel tomatoes (I used the lime-cilantro style), frozen corn, salt, pepper, smoked cumin, smoked paprika, ground coriander, ground cinnamon, cocoa powder, butter, and lime juice. I also topped my Tex-Mex Stuffed Sweet Potatoes with shredded cheddar cheese and chopped scallions, but those items are completely optional. The ground cinnamon and cocoa powder deepens the savory flavor of the Tex-Mex “stuffing” and gives it a light molé touch, which works wonderfully well with the sweetness of the sweet potato. And the lime juice cuts through the richness of the filling and balances out all the herbs and spices perfectly, while that little touch of butter helps to keep the flavors lingering on your tongue, bite after delicious bite. Sweet Potatoes are high in vitamin B6 and they’re also a good source of vitamin C.
Sweet Potatoes are also high in vitamin D which helps build healthy bones. Sweet Potatoes contain iron which helps support a healthy immune system. You can’t argue with all that, can you? 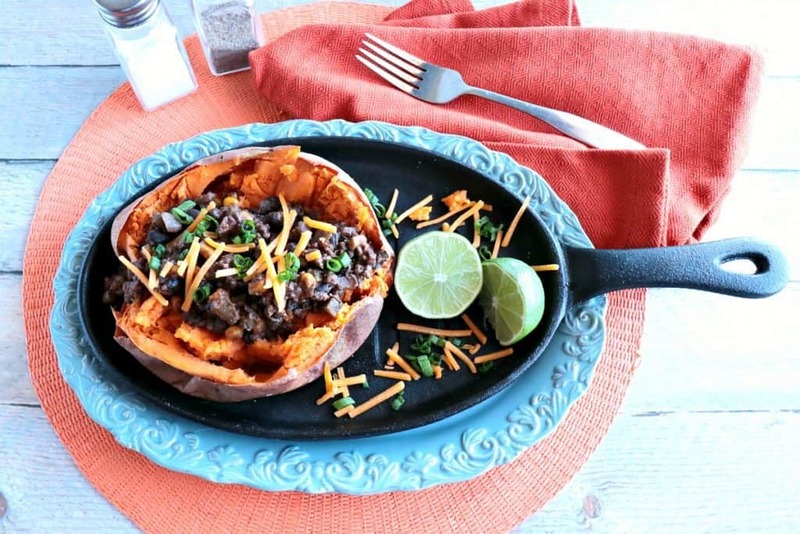 Making Spicy Smoky Tex-Mex Stuffed Sweet Potatoes is as easy as one, two, three. 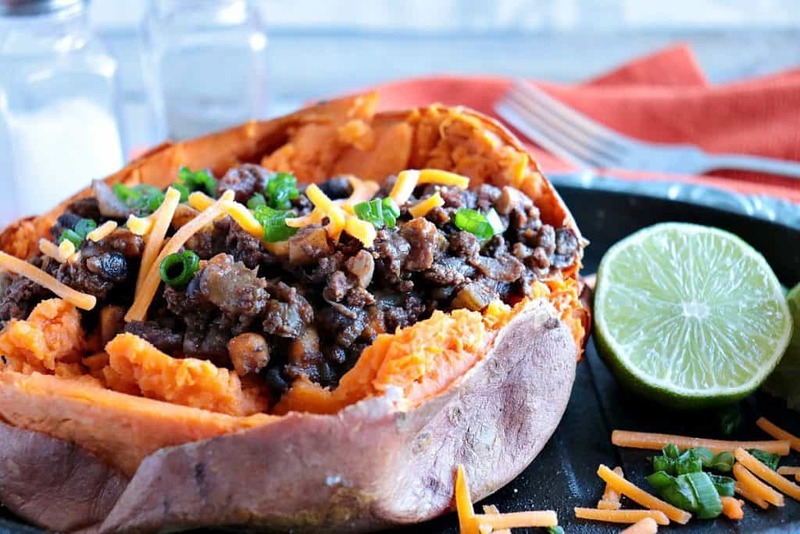 While the sweet potatoes are baking in the oven or microwave, in a large skillet brown the ground beef (or ground turkey) along with the onion and celery. Once the meat is no longer pink, add the corn, beans, fired roasted chiles, and Rotel tomatoes into the skillet and stir to combine. Next stir in the salt, pepper, smoked cumin, smoked paprika, ground coriander, ground cinnamon, and cocoa powder to the skillet. Mix well. Simmer for 5 minutes and stir in the fresh lime juice and butter. Split the sweet potatoes in half lengthwise and fill with a generous helping of the Spicy Tex-Mex filling. Top with shredded cheddar cheese and chopped scallions (if desired), and serve hot! 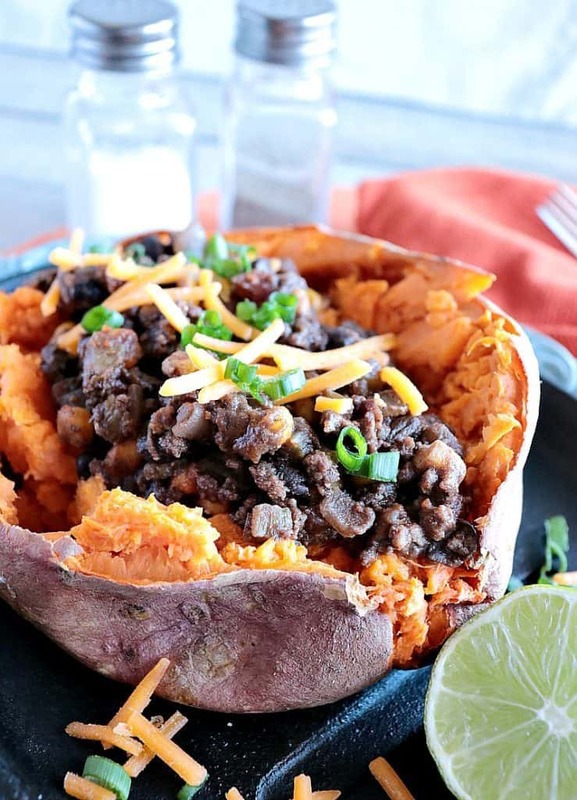 When you want to spice up your dinner options, but still want something healthy and quick, this recipe for Tex-Mex Stuffed Sweet Potatoes with Ground Beef & Beans may be just the thing you're looking for! Cook the sweet potatoes in an oven or microwave until soft. Meanwhile, in a large skillet over medium/high heat, brown the ground beef, onion, and celery. When the meat is no longer pink, stir in the black beans, chiles, tomatoes, and corn. Reduce the heat to medium/low and stir in the salt, pepper, cumin, paprika, coriander, cinnamon, and cocoa powder. Stir in the fresh lime juice and butter until melted. Once the potatoes are cooked, split them lengthwise and fill them generously with the Tex-Mex filling. Serve hot with shredded cheddar cheese and chopped scallions if desired. I hope you’ve enjoyed today’s recipe for Spicy Smoky Tex-Mex Stuffed Sweet Potatoes as much as I’ve enjoyed bringing it to you.